Stock Gaylard Estate is a traditional country estate in the heart of Dorset. With plenty of woodland, a deer park, a small lake and working farm you are truly in the midst of the countryside. The estate has been preserved over the last couple of hundred years and is an unspoilt environment that encompasses modern farming with a number of Sites of Special Scientific Interest and wildlife is abundant. We have an ethos of conservation and preservation. Our traditional yurts, wacky conversions and furniture have all been made on site with us much of our own wood as possible! All our sites are ‘off grid’ but with all the comforts and luxuries one would expect including hot showers! 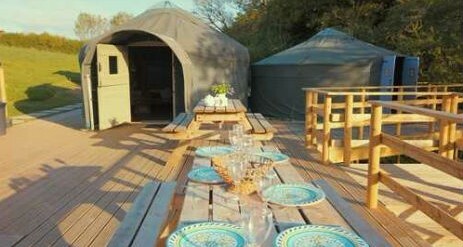 As glamping goes we are quite unique! 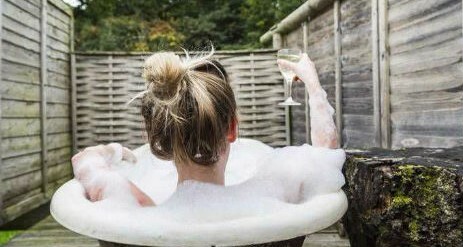 We have four separate sites with a 5 -10 minute walk between them and when you stay with us you book the whole site just for you and your friends & family! No shared facilities here! Simply relax with those who are most important to you and get in touch with nature. At Stock Gaylard we have four unique sites sleeping 2 – 14! Have private bathroom, kitchen and dining facilities. Are dog and children friendly. Kick back and relax in our woodman’s wagon for two, and watch the sunrise and sunset on your elevated decking whilst enjoying your morning coffee or evening tipple. The wagon has a large double bed, indoor seating area and dining area as well as a gas hob, fridge & sink. Step outside on to your decking or head to your campfire for a traditional camping experience. Just a few meters from the wagon is your hot shower and loo with a view! Both are for your exclusive use. NB: We do allow children in their own tent for a small fee. This is our least traditional site for those who like something a bit different! Meet our amazing dual purpose double-decker bus. Downstairs you will find 5 single beds and head upstairs to find a full kitchen complete with dining table and bus seats! 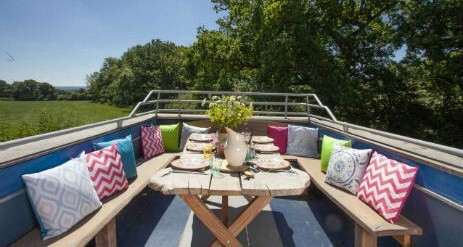 Go out the door to find yourself in the open air on the top-deck with a stunning alfresco eating area and BBQ. An exceptional spot to enjoy an evening drink! 6 other guests will have to disembark for the evening and head to our shepherds hut with bunkbeds of our bunk house with a double and two singles. You will find your bathroom in a horsebox complete with bath & shower! 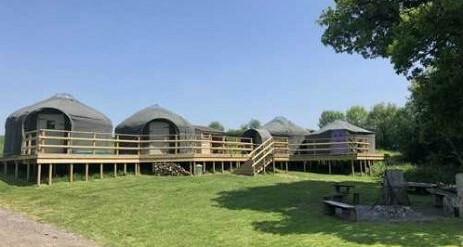 Made up of four stunning handcrafted yurts just on the edge of Brickles Wood. 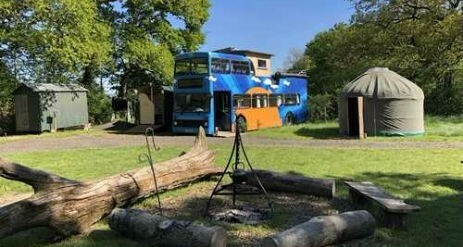 2 yurts have a double bed, two singles and a futon, one has four singles and the last is a beautiful living yurt with a table, plenty of seating, a gas hob, gas fire and games and books. Outside you’ll find your toilet, shower and wood-fired open air bath as well as a covered area with a gas oven and sink. Welcome to our largest camp set on raised decking. The site is made up for four yurts. Two with a king sized bed, two singles and a futon and one with four singles. 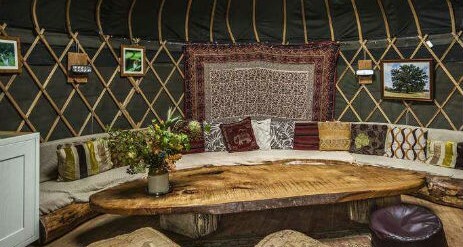 The final yurt is a stunning living yurt with gas hob, gas fire, plenty of seating and a table. Outside is a glorious eating area on the decking and a covered kitchen with fridge, oven and sink. There is also a shower, toilet and open air wood-fired bath! NB: We allow 2 extra campers in their own tent for a small fee. Each of our sites has its own private facilities. Are sites are off-grid! So we do not have the facility to charge your devices – please think about bringing a portable/solar powered charging unit. Dorset is packed with places to visit and things to do. From the craggy Jurassic Coast and the sandy beaches to historic castles, museum and more. There are plenty of outdoor activities to get involved in, including watersports, quad biking, archery, kayaking… the list is endless! Although we really are in a rural idyll, there are a number of shops locally for you to get supplies from and we are only 5 miles for the market town of Sturminster Newton and 8 miles for the historic Sherborne. Changeover days are Mondays & Fridays (excluding Sawpits).